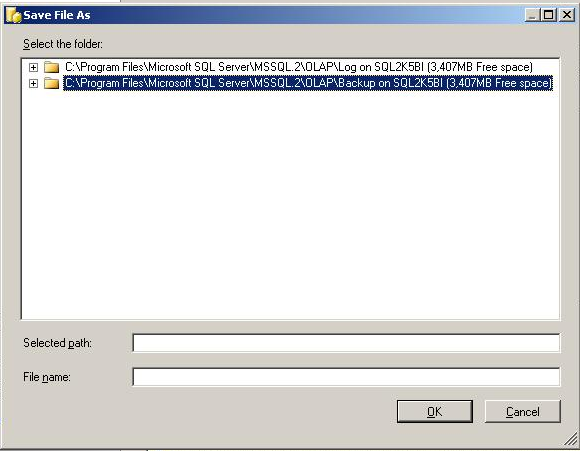 In this article you will learn the steps to backup a SQL Server Analysis Server Database. 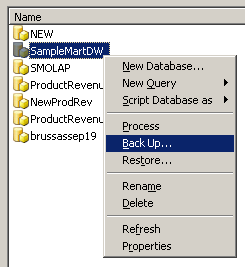 After logging to the Analysis Services, in the object explorer, select the database that needs to be backed up. Right click the database and from the pop-up menu choose Backup. 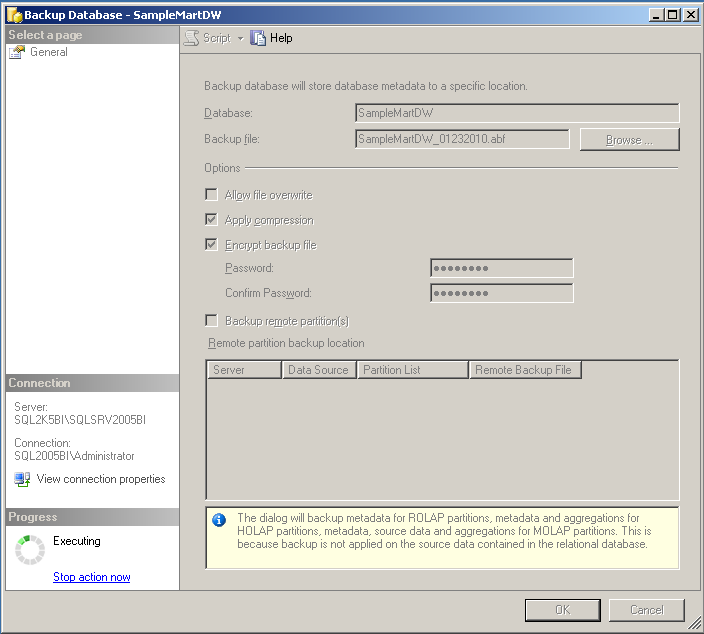 Backup database dialog is displayed which is similar to many windows based dialog boxes. It displays the database that we are going to backup. In the text box against backup file, type in the filename that you intend to place the backup in. The backup file extension for an SSAS database is by default “.abf” (which in my opinion stands for Analysis Services Backup file (or format). There are some options to choose from if required. Options such as Allow file overwrite will overwrite the existing file (if there exists a file with the same name at the same location). You can additionally compress the backup file while reduces the backup file size and protect the backup file by providing a password. That password needs to be given while restoring a database from the same backup file. Click OK to continue to backup the database. 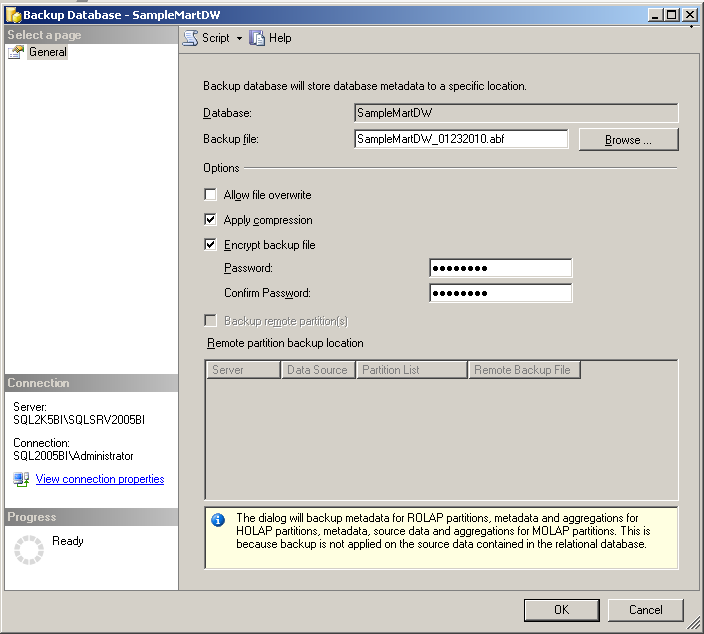 The backup is performed and the screen similar to the one shown below is displayed as long as the database backup is being performed. The Progress section of the dialog (left bottom of the dialog box) displays Executing. Note that after the backup is done successfully, it does not display a message box about the successful completion of the backup. You need to check for the existence of the backup file at the destination location. This entry was posted in SSAS and tagged Backups, SSAS, Tutorials by Brumedishetty. Bookmark the permalink.